Water management is a vital component to the success of every splash pad installation. With options for any size, our water management solutions are specifically engineered for your project. Adventure Aquatic Play offers a range of sustainable water management solutions with the best operating efficiency and the highest standards of water quality in the industry. Need help deciding which option is best for you? We have created a helpful guide to the features, benefits and requirements of each. 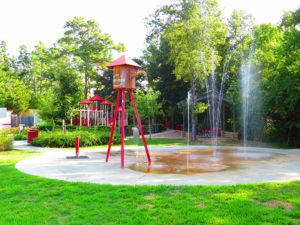 Recirculation is a closed circuit system that recycles and disinfects the water to and from the play area through the advanced water quality management System. Manufactured for the highest efficiency in water recirculation, this system provides the highest quality water filtration and disinfection for busy aquatic play areas. Recirculation Systems’ underground tanks feature auto-fill capabilities, filtration system pump, filter, and chemical controller. Though these systems do have a higher initial cost, long term they are more cost-effective than both drain away systems and standard commercial pools. Drain Away systems make easy to operate and low maintenance Aquatic Playgrounds. These systems use potable water that goes through the play area. Effluent water is then returned to the municipal wastewater system, or percolated back to the water table. Consideration should be given to monthly fees associated with public water. Water management solutions are an essential component to the success of any aquatic play project. Adventure Playground Systems is here to help you decide which solution best fits your needs. We have more than 20 years of experience in the commercial play industry and specialize in creating innovative splash pads with sustainable water management solutions specifically engineered for each project. We’re confident that we can help you find the most effective solution for your needs among our various designs and custom creations. Ready to start planning your next aquatic playground or splash pad? Contact us at 1.888.935.2112 or online to discuss which water management solution is right for you. 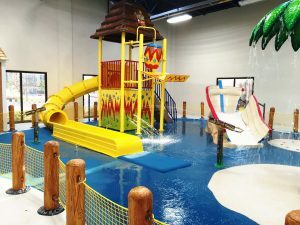 Our Adventure Play Experts will happily guide you toward the best products for you as we work to create the aquatic play destination of your dreams.